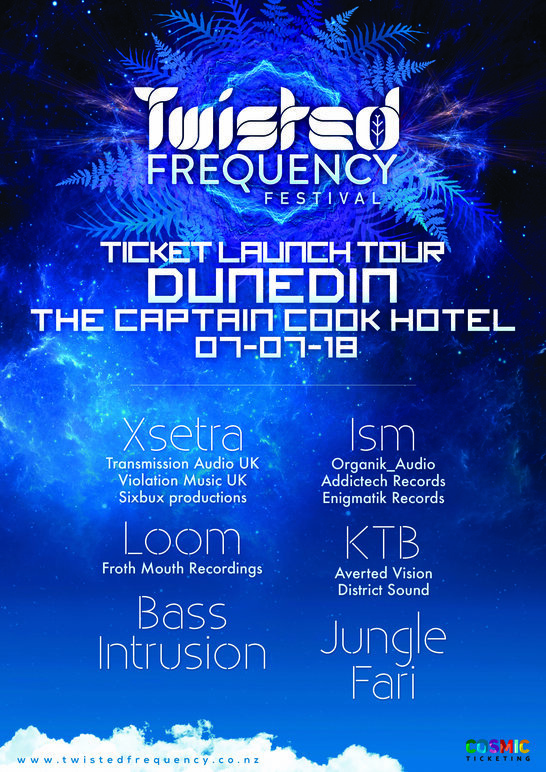 Twisted Frequency Festival is proud to present the Ticket launch tour! Bringing you a stonking heavy bass party!!! Celebrate the early bird tickets going up on sale and get a proper underground dance floor session in. A favorite among our bass head fans, coming from Sydney Australia we have Xsetra!!! On first performing at Twisted Frequency three years ago he has quickly become a part of the family and we are so lucky to have him return to share his weird and wonderful drum and bass journey with us once again. Next up we have Ism (Formerly organikismness) Feature heavyweight of the south island bass scene, Ism Has been a long standing contributor to many elements of the Aotearoa bass music world and is another perfect addition for the ticket launch tour! Having just finished touring his other project Soulware with an incredible response nation wide, Ism is jumping back on the road to bring us that beautiful NZ Organik _ Audio sound. One of the most talented performers and producers in the Twisted Frequency Team is Loom. Holding down a wide range of quality electronic styles at festival across NZ and the world for over ten years now, Loom has established himself as an incredible asset to the underground party world, It wouldn't be a bass party tour without him.